BASSETS HAVE BEEN A PART OF MY LIFE FOR THE PAST 42 YEARS - MUCH LONGER THAN MY CHILDREN. CARING FOR THEM IS SECOND NATURE AT THIS POINT SO I'D LIKE TO PASS ALONG SOME EXPERIENCE TO HOPEFULLY HELP SOMEONE ELSE. FOOD: IT IS IMPORTANT TO FEED YOUR BASSET A HIGH QUALITY DRY FOOD AND IT IS OF UPMOST IMPORTANCE THAT A BASSET NOT BE OVERFED. THIS BREED IS NOTORIOUS FOR BECOMING OVERWEIGHT ESPECIALLY WITH OWNERS THAT DELIGHT IN GIVING TREATS. IF YOU CHOOSE TO USE TREATS YOU MUST REMEMBER TO CUT BACK ON THE QUANTITY OF THEIR NORMAL MEAL. ADULT BASSETS CAN BE FED ONCE OR TWICE PER DAY BUT REMEMBER THE AMOUNT ON THE BACK OF THE DOG FOOD BAG IS THE AMOUNT YOU GIVE THE DOG IN A 24 HOUR PERIOD. SO IF YOU CHOOSE TO FEED TWO MEALS PER DAY - CUT THAT AMOUNT IN HALF FOR EACH FEEDING. ALSO - THE WEIGHT-FOOD RATIO IS BASED ON YOUR DOGS HEALTHY WEIGHT NOT THEIR ACTUAL WEIGHT. IN OTHER WORDS, IF YOUR DOG IS OVERWEIGHT - DON'T USE THE AMOUNT IT STATES FOR YOUR DOG'S WEIGHT - CUT IT BACK A LITTLE. YOU SHOULD BE ABLE TO SEE THE OUTLINE OF DOG'S RIB CAGE BUT YOU SHOULD NOT BE ABLE TO COUNT RIBS. IF YOU HAVE A THICK CUSHION OVER THE RIBS - YOUR DOG IS OVERWEIGHT. AN OVERWEIGHT BASSET IS GUARANTEED TO HAVE HEALTH PROBLEMS - YOU ARE ASKING FOR TROUBLE IF YOU ALLOW YOUR DOG TO BECOME OVERWEIGHT. YOU CAN'T BLAME THE DOG HERE SINCE YOU ARE THE ONE CONTROLLING THE INTAKE. OVERWEIGHT BASSETS WILL HAVE JOINT PROBLEMS AND BACK PROBLEMS AND WILL SUFFER. DO YOUR DOG A REAL FAVOR AND KEEP THEM WITHIN THEIR HEALTHY WEIGHT RANGE. WATER: FRESH WATER SHOULD BE AVAILABLE AT ALL TIMES. JUST LIKE FOR HUMANS - YOU CAN'T GET ENOUGH FRESH WATER. BATH: BASSETS NEED REGULAR BATHS. THEY ARE HUNTING HOUNDS BY NATURE AND THEY SECRET A "MASKING" ODOR WHICH IS VERY BENEFICIAL WHEN CHASING GAME. A PET BASSET DOES NOT ESCAPE THIS SCENT BUT YOU CAN KEEP IT AT BAY WITH REGULAR BATHS. COUNT ON A BATH EVERY COUPLE OF WEEKS TO KEEP THEM SMELLING NICE. IF YOU LIVE IN A COOLER CLIMATE YOU WILL NOT NOTICE THE ODOR AS MUCH; IF YOU LIVE IN THE HUMID HOT AREA LIKE US - YOU WILL NOTICE IT A LOT MORE - ESPECIALLY IF THEY GO OUTSIDE AND GET SWEATY. ALSO - BEWARE - A BASSET WILL OFTEN DROP & ROLL ON TOP OF DEAD VARMITS. YUCK, I KNOW - BUT IT'S A FACT. I GUESS THIS IS ANOTHER OF THOSE HUNTING TACTICS - YOU WILL HAVE TO HEAD STRAIGHT TO THE SHOWER AFTER THESE ENCOUNTERS! TEETH: BASSETS HAVE JAWLS - ANY DOG WITH JAWLS WILL HAVE DENTAL PROBLEMS UNLESS YOU STAY ON TOP OF THEIR DENTAL CARE. THOSE JAWLS HOLD THINGS - INCLUDING SOME EXTRA SLOBBER. I GIVE OUR DOGS RAW BONES - IT'S ABOUT THE BEST DENTAL CARE YOU CAN GET FOR A DOG. YOU JUST HAVE TO BE "BONE" SMART ABOUT IT. GO TO A BUTCHER AND ASK FOR LARGE BEEF BONES THAT CAN'T SPLIT. WE HAVE THE BUTCHER CUT A LONG LEG BONE (FEMUR) UP AND IT MAKES SEVERAL BASSETS VERY HAPPY. I AM AMAZED AT HOW WELL THIS CLEANS A DOGS TEETH. AND TRUST ME - I KNOW HOW TO CLEAN TEETH - MY DAD'S A DENTIST! RAW BONES WILL CERTAINLY CUT DOWN ON THE NUMBER OF TIMES YOU ARE AT THE VET FOR TOOTH CLEANINGS. KEEP A CHECK ON THEIR TEETH SO YOU CAN CATCH PROBLEMS BEFORE THEY ARE SERIOUS ENOUGH TO REQUIRE AN EXTRACTION. EARS: CLEAN WEEKLY. HOPEFULLY YOUR BASSET HAS EXTREMELY LONG EARS - THEY ARE SO BEAUTIFUL. HOWEVER WITH EVERY ROSE COMES A THORN............. THOSE EARS KEEP THE EAR CANAL COVERED WHICH KEEPS THAT AREA WARM AND MOIST. THAT IS THE PERFECT ENVIRONMENT FOR YEAST AND BACTERIA TO GROW AND THAT STUFF STINKS AND CAN CAUSE INFECTIONS! 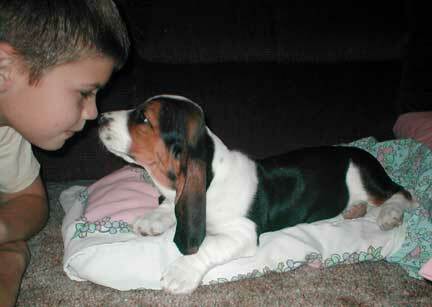 WEEKLY CLEANINGS WILL PREVENT ANY TROUBLE FOR YOUR BASSET AND WILL KEEP THE SMELL AT BAY. YOU CAN MIX YOUR OWN CLEANING SOLUTION FOR LESS THAN A DOLLAR. SIMPLY MIX 1/2 WHITE VINEGAR WITH 1/2 RUBBING ALCOHOL INTO A CONTAINER THAT HAS A POINTED SPOUT. FILL THE EAR WITH THE SOLUTION AND MASSAGE IT IN AND ROTATE THE EAR AROUND. YOUR BASSET WILL LOVE THIS PART. THEN STEP BACK AND LET THEM SLING. A PAPER TOWEL OR GUAZE IS GREAT TO WRAP AROUND YOUR FINGER AND CLEAN UP THE EAR CANAL AREA. NEVER USE A Q-TIP - YOU MAY GO TOO FAR AND DAMAGE THEIR EARS. KEEP SWIPING UNTIL YOUR PAPER TOWEL IS NOT GETTING DIRTY ANY MORE AND THEN REPEAT ON THE OTHER EAR. IT'S VERY SIMPLE AND QUICK - NOT A BIG PROBLEM. EXERCISE: YOUR BASSET WILL DEVELOP INTO A COUCH POTATO IF ALLOWED. AS WITH US HUMANS - THIS BRINGS ON A HOST OF PROBLEMS. SITTING AROUND ALL DAY ALLOWS THE CALORIES TO PILE UP INSIDE US AND THE FAT TO PILE ON. THE HEART GETS WEAK AND SO ON.................. DO YOUR BASSET AND YOURSELF A FAVOR - GET OUTSIDE AND RUN AND PLAY OR AT LEAST WALK, WALK, WALK! NAILS: TRIM THEM REGULARLY AND TRY VERY HARD NOT TO MAKE THEM BLEED. YOUR BASSET WILL NEVER FORGET IF YOU HURT HIM AND THE NEXT TIME WHEN YOU GET THE CLIPPERS - THEY WILL RUN, HIDE AND NOT BE STILL. DON'T THINK GROOMERS CAN DO IT BETTER EITHER - I'VE SEEN MANY BASSETS WHO HAD GROOMERS CUTTING THEIR NAILS UNTIL THEY BLED. YOU CAN DO IT YOURSELF WITH THE PROPER EQUIPMENT AND PATIENCE. YOU CAN GET NAIL CLIPPERS AT ANY DEPARTMENT STORE THAT CARRIES DOG SUPPLIES. IF YOUR DOG'S NAILS ARE LIGHT COLORED YOU CAN SEE THE VEIN INSIDE THE NAIL - STAY BELOW THAT VEIN. YOU CAN ALSO TELL WHERE TO CUT IF YOU LOOK CLOSELY AT THE SHAPE OF THE NAIL. THE NAIL ACTUALLY BENDS AT A POINT JUST BELOW THAT VEIN - CUT AT THE BEND. TRIMMING MORE FREQUENTLY IS MUCH BETTER THAT TRYING TO GET THEM REAL SHORT TO PREVENT HAVING TO CUT THEM AGAIN SO SOON. ALSO: CUTTING OFTEN KEEPS YOUR DOG USED TO IT.